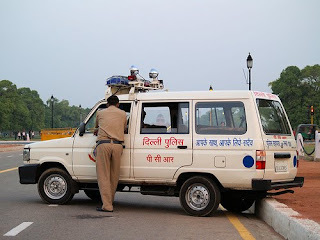 INDIA'S senior most policemen like DGPs will gather in New Delhi for three days beginning September 14, to deliberate on issues concerning internal security. Union home minister P Chidambaram will inaugurate the meet whereas Prime Minister Dr Manmohan Singh will address the conference on September 15, 2009 in addition to presenting police medals for meritorious services. The major issues that are likely to dominate the meet include internal security threats, including Left Wing extremism , coastal security, insurgency in the North-East and circulation of fake currency notes among others. The agenda also includes presentations on important policing issues such as national police mission, corporate frauds and security arrangements for the forthcoming Commonwealth Games in 2010. Director, Intelligence Bureau, is the ex-officio chairman of the conference. Following the tradition established by Sardar Vallabh Bhai Patel, the first home minister of the country, the conference is customarily inaugurated by the Union home minister. Action & Appointments Justice Bipin Chandra Kandpal, senior-most Judge of the Uttarakhand High Court has been appointed as the Chief Justice of that High Court with effect from September 10, 2009 when the current incumbent Justice Vinod Kumar Gupta retired. A comprehensive mechanism to deal with the menace of internal terrorism is the need of the hour. Hope something concrete will come out of the meet..